I did a few simple tests to see what the effects of various aeration methods were on starters, and thought other people might find the results interesting. 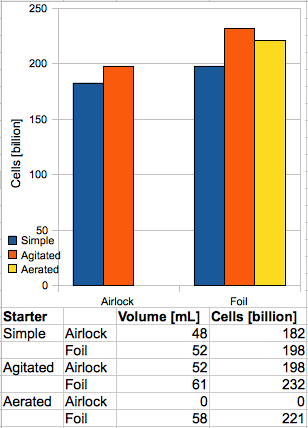 A full writeup is here: http://seanterrill.com/2010/01/14/aeration-and-yeast-starters/ but the results are summarized in the image below. "I feel sorry for 17 year olds. This stuff isn’t terrible, but I wouldn’t want to drink it." I support your experimental spirit and enjoyed reading your write-up. But unfortunately I see a problem that makes your results less applicable to brewing. The use of an all carbohydrate growth medium limits yeast growth through the unavailability of a nitrogen source. And that's what you might be seeing here. It is likely that yeast growth was not limited by agitation or oxygen availability but by the amount of nitrogen that the pitched yeast had in it and was able to share when it multiplied. At some point that wasn't enough. Given the errors on your results one can make the argument that the evaluated parameters had little effect on yeast growth. Although some tendencies seem to be apparent. To have a wort with a nitrogen source you can use sucrose + diamonium phosphate or brewer's wort. With diamonium phosphate you may even be able to create an environment where O2 will be the limiting growth factor. That is not necessarily true for all malt wort. Kai: the lack of access to FAN is definitely the weak link, and I would caution anyone against assuming the results are directly applicable to wort starters. I'm not sure what you mean about errors in the results though. The error in the grad cyl readings is pretty small relative to the values (0.9 mL), and while I don't want to read too much into a single dataset, the trend seems pretty compelling to me. If FAN was the (only) limiting factor I would have expected all the samples to produce the same amount of slurry. I'm not sure what you mean about errors in the results though. The error in the grad cyl readings is pretty small relative to the values (0.9 mL), and while I don't want to read too much into a single dataset, the trend seems pretty compelling to me. The error is not so much in the volume measurement itself but in converting that volume measurement into a number of yeast cells. When you poured off the liquid, how much yeast was still in suspension and when you poured the slurry into the cylinder, how much got left behind in the jug? Or did you rinse the jugs as well. Don't get this wrong, I don't want to discourage your interest in experimenting with this I'm just bringing up points that others may have affected your results as well. I see what you mean. I did control for those variables as best I could. The starters were cold crashed at 0C until they were visually clear, then decanted before the slurry was poured. I then rinsed each jug once with tap water. That said, the yeast I used was *very* non-flocculent (I suspect some of that is due to the lack of proteins to provide conglomeration sites). So I'm sure I lost some yeast down the drain, although the amounts were too small to be visible. Don't worry about hurting my feelings. I appreciate the questions as an important part of the process.